You can easily create and customise Keysticks controls using the Profile Designer. It has ready-made templates for mapping your Xbox 360 controller to the keyboard / mouse controls of games and for adding virtual keyboards to your profiles. You can drag and drop to try new combinations and apply them with the designer window still open. Check out the video on our home page if you haven't seen it yet, to see Keysticks in action, or browse the screenshot gallery. 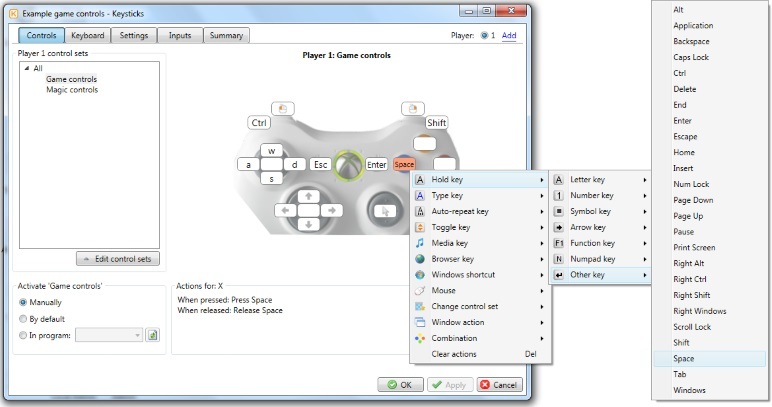 When you get familiar with Keysticks controls, you might like to try connecting your computer to your TV so you can play PC games on your TV. It means you can use your controller to control the game (running on your PC or laptop), and your telly as the display. You might also like to try controlling your music wirelessly too.